I've been trying out Google+, and I like it so far. It's been just a few days since I joined, and I have enough people "circled" mutually to keep interesting discussions going. I think I am going to post things to Google+ when I want discussions with people with various "circles" I defined, and my rather high-frequency rants stay going into Twitter timeline, and they are forwarded to Facebook status and Google Buzz. I also tried out hangout feature with my wife who was using her computer...sitting just next to mine. I'm not so used to doing video chat, but testing out of hangout made me think of a good friend who took assignment in Angola and left the city. He and I used to hang out almost every Sunday at our favorite coffee shop. We chat, or just comfortably kept company while we read, sipping tasty coffee. I wonder if it will be a common thing to bring on the devices to let us remotely "hang out" while each sitting at local coffee shops or home. 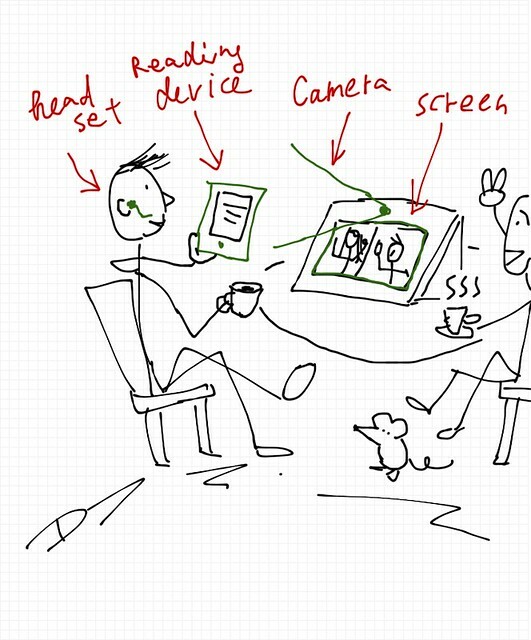 Until some creative people come up with more compact set of devices, I'd need a headset to hear remote friends well through the ambient noise in the coffee shop, a camera to shoot me, and a screen to display friends. I read with digital reading devices nowadays, so one more device for me: It sounds like a lot of devices to carry. Oddly, people usually get annoyed more when they see a person talking to cell phone while his voice is no louder than other people talking to their companies at the table. So, I should have a real buddy sitting at the same table so I don't look like talking just to the microphone. I probably also need to have a headset feeding voices from remote site directly to my ear so I don't annoy people with the sound coming from the speaker. The microphone has to be very good to filter ambient noise. Above all, we probably need to wait until the coffee shop society adapt to such "avant-garde" people. Hmm...this whole idea may be just odd and wrong. But I just wish if I could hang out with remote friends in our favorite coffee shops.